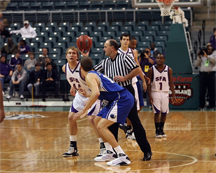 Jump ball in a game of basketball. The official supposedly has no stake in the game. His role is to ensure a fair outcome by enforcing the rules of the game. Coordinators in the project context have analogous responsibility. They're responsible for producing a good outcome by ensuring that all team members have what they need to carry out their roles. In the project context, to coordinate is to organize events or activities across a group of people to help them work together effectively. The coordinator role often serves as a clearing agent for information, gathering data and distributing it across the project team. And sometimes, coordinators negotiate with team members to help them find ways around obstacles, conflicts in schedules, and conflicting agendas. Ethical coordinators are reliable sources for information about what some call the project's ground truth — its reality, its true status. Unethical coordinators are up to something else. Their motives vary, but generally they have two sets of goals that can sometimes conflict. One goal, clearly, is the project's success. Another goal is more personal — the success of the organization or team they represent, or perhaps the success of their immediate supervisors. Coordinators who are in these conflict-of-interest situations are at risk of a breach of ethics when they place the personal goal above the project's success. For example, consider an enterprise — call it OMC (Over Matched Corporation) — that's undertaking a large and complex project — call it Marigold — that requires sophisticated capabilities unavailable in-house. OMC has enlisted external assistance — call it LPC (Large Project Coordinators) — to coordinate Marigold. While it's true that LPC personnel want Marigold to succeed, they also want LPC to be seen as contributing to Marigold's success. And that situation can create a conflict of interest for LPC personnel. They must exercise their responsibilities with special care to avoid ethical breaches. Most do. Some don't. above the project's successinto the ethical difficulties relating to coordinating large projects, let's consider the relatively narrow topic of how LPC personnel might make decisions about Marigold project information. For convenience I'll use the name Larch to refer to LPC's coordinator on Marigold. When Larch takes minutes at meetings for distribution afterwards, he gathers status information about action items. When action item Daffodil is overdue, he can choose how he presents the reasons for it being late. Assume for the moment that the reasons for Daffodil being late do shelter Daffodil's owner from any repercussions. Larch might be more inclined to include those reasons in his meeting minutes if Daffodil had been assigned to LPC personnel, than he would be if it had been assigned to OMC personnel. He might also be more inclined to include that exculpatory information if Daffodil's owner is someone from OMC whom LPC favors. If his choice is influenced by whether or not LPC favors Daffodil's owner, he might have crossed the ethical line. "Manufacturing" information includes creating it from whole cloth, but it also includes unusually energetic research to develop information that meets specific needs. For example, Larch might want to provide cover for an LPC mistake or lapse; or he might want to raise questions about the performance of an OMC employee or someone affiliated with a contractor other than LPC. Any such activity at odds with the truth, or undertaken for reasons other than Marigold's success, might constitute an ethical breach. Larch can also control the timing and targeting of information distributions. He can provide information earlier to some people than to others, which provides advantages to those who receive it early. For example, if he uncovers bad news about LPC performance, he can provide it to LPC personnel, who then have extra time to prepare responses or to fix whatever is amiss. He can do this for seemingly appropriate reasons: "I asked Nan to review the report for accuracy," or "I asked Ed for background on the Severn delays." Would you like to see your comments posted here? rbrenxiwmKITflsztkiaener@ChacEJjdrTuybiRIqPGsoCanyon.comSend me your comments by email, or by Web form. When we manage risk, we usually focus on those risks most closely associated with the tasks at hand — content risks. But there are other risks, to which we pay less attention. Many of these are outside our awareness. Here's Part II of an exploration of these non-content risks, emphasizing those that relate to organizational politics. I offer email and telephone coaching at both corporate and individual rates. Contact Rick for details at rbrenRHbgrvmgfvCPSgvwner@ChacJkUdMtZlxAJpxXYEoCanyon.com or (650) 787-6475, or toll-free in the continental US at (866) 378-5470.